Well in might have been a better idea to open a thread on the Conservative party leadership race in general Fleur and at least let people here play with the charts! Still, I do agree Theresa May looks highly likely to be the winner of this contest and therefore our next PM. Fleur did you already know that Theresa May is a diabetic? I only found out yesterday that she is a Type 1 diabetic which is quite serious. A while back she had to explain why she had suffered such weight loss which had been noted in the media. I am a big fan of Charles Carter and the various degrees he lists for a number of conditions and characteristics do seem uncannily to work. I think the book "Encyclopaedia of Psychological Astrology" has something of a misnomer because there's nothing psychological about it! Many would be dismissive of this book but he was a very astute and accomplished astrologer, far far better than many would give him credit for. He was a predictive astrologer in a modern age ! No birth time for Theresa May but I can't see any other result than her becoming prime minister. You are right I think to express concerns about her health and how it might impinge on being prime minister. Theresa May will succeed David Cameron as Prime Minister on Wednesday evening after May�s challenger in the Conservative leadership race, Andrea Leadson, pulled out of the contest. Yes. However, one very important detail to look out for is what time May is received by the Queen to 'kiss hands' on Wednesday. This time is the closest we have to an inauguration chart for a British PM in their term of office. So keep your eyes peeled on Wednesday folks and lets feedback on an accurate time for that if possible. On Theresa May's chart we obviously have no timed data. 1st October, 1956, Eastbourne, England. Another Sun Libra like David Cameron. Like Cameron a strong connection to the UK 1801 chart ASC at 7 Libra. In David Cameron's case it was his Venus (ASC ruler) on that degree. Theresa May has her Sun close to that degree. Also her Sun ruler (Venus) conjunct the UK Saturn. May's Jupiter in Virgo is sextile the UK Moon in Cancer. May's Saturn in an out of sign square to UK Pluto and Mercury in an out of sign conjunction to the UK Uranus. NB: Angles/Moon based on an untimed Noon chart. If we are going to attempt a rectification I suppose the first stage is determining her Moon sign. She could be Moon in Leo if born before 09.25am but a Virgo Moon seems much more likely to me. She is often referred to as the 'safe pair of hands' to see the country through this crisis and her reputation for being quiet, very hard working, unpretentious, pragmatic, and good at detail all sound Virgo to me. Of couse it could be her rising sign which would accentuate her Mercury in Virgo. In that case she would have a Moon Leo similar to previous British PMs like Churchill, Thatcher, & Cameron. May is clearly benefiting from her Jupiter return in Virgo just now. Hi there - I'm working on a time of 7:40AM at the moment, which gives very nice SA measurements for today. The time gives an MC of 18 Cancer, which is the degree of the UK 1801 moon, with a natal late Leo Moon for May. I was originally swayed by the idea of a Virgo Moon, but anyone aspiring to the leadership of a country needs something more than 'attention to detail'. I have also noticed that successful politicians tend to be born with the Sun between the asc and MC. Retro. Mars on the sixth house perhaps symbolises May's health difficulties with diabetes. Here is the solar arcs for today in a bi-wheel. Hi there - I'm working on a time of 7:40AM at the moment, which gives very nice SA measurements for today. The time gives an MC of 18 Cancer, which is the degree of the UK 1801 moon, with a natal late Leo Moon for May. I was originally swayed by the idea of a Virgo Moon, but anyone aspiring to the leadership of a country needs something more than 'attention to detail'. I have also noticed that successful politicians tend to be born with the Sun between the asc and MC. Thanks. This is an interesting contribution to what i suspect will become a crowded field soon...rectification charts for PM Theresa May! Your proposed rectification would be a stellar chart indeed! Moon on the fixed star regulus (Like Churchill and Thatcher). And an MC on the UK Moon. Indeed you might be seen as delineating the optimal chart for a nativity that day. But of course many people assuming the office of PM dont have such a powerful nativity or extensive links to the UK chart. Nevertheless I value your input to this topic. I still have a bit of a struggle accepting a Leo Moon myself based on her observed personality. I could hardly think of someone demonstrating more sterotypical Virgo features. In rectification terms I follow the maxim that the chart should follow the person and not vice versa. Before fine tuning a rectification I would need 20-30 key dates to work on and I am still researching that. I find profections one of the most reliable tools in natal astrology. It is very intriguing that Mrs May is going through a 12th house profectional year. Not a time usually associated with obtaining national public office. We know she has not be able to have children so I might expect either a malefic ruling or present in the 5th and/or an infertile sign. I thought I would offer some comments from the American mundane astrologer Theodore White who has also proposed a rectification for Theresa May's chart. by Theodore White, mundane Astrolog.Sci. The year 2016 will continue to see an increasing number of new and fresh faces on taking leadership of nations globally. The next new face is the rise of Theresa May, who will become England's new prime minister on Wednesday, July 13, 2016. Many astrologers are trying to find horoscope of Theresa May, but as there is no reported time of birth, some have assumed a noon birth and work from there. However, using the powerful technique of astrological rectification of natal horoscopes, I have cast Theresa May's nativity and attached her nativity. Born with a Libra Sun, Virgo Moon, Scorpio Ascendant and Leo Midheaven, Theresa May is far different than her predecessor, David Cameron. She was born with her natal Moon, Mercury, Saturn, Neptune and Pluto - all at the anaretic degrees of tropical Virgo, Scorpio, Libra and Leo. A main feature of her nativity is a Moon-Pluto conjunction that squares her natal Saturn & North Lunar Node in Scorpio. Theresa May will take the leadership reins of the United Kingdom to make historic decisions on the fate of the nation - and that of the European continent - during her term as prime minister. Included are her secondary progressions, which show that in the year 2018 there will be a progressed partial eclipse of the Sun relative to the day of December 2, 1956. At this time, in 2016, her progressions see a last quarter Progressed Moon in Scorpio that is heading toward her progressed Saturn and progressed Sun in tropical Sagittarius. I expect her time as prime minister to be extremely challenging over the next three solar years and will have more to say on this in subsequent forecasts. Hi Mark - thanks for the feedback. The chart is too good to be true. I agree! Although the SA works out well, the SR for the year doesn't look powerful enough to me in terms of houses. She has a big t-square in her 2015 SR and I'm wondering whether all or part of that should occupy angular houses. There is an out-of-sign opposition between Saturn and Moon, squaring Venus and Mars respectively. The main hook with the SR for 7:40AM is Mars and Jupiter close trine to Capricorn ascendant from the eighth and sextile MC in Scorpio. Using Alcabitius, any time between 7:40AM and 9:40AM would place retro. Mars in the fifth, to follow your observation re. children. You could go closer to 10:00AM and still have the Mars within reach (five degree rule) of the fifth. Accident Father was when Mars transited the MH, partile square to Urano.18 October 1981. 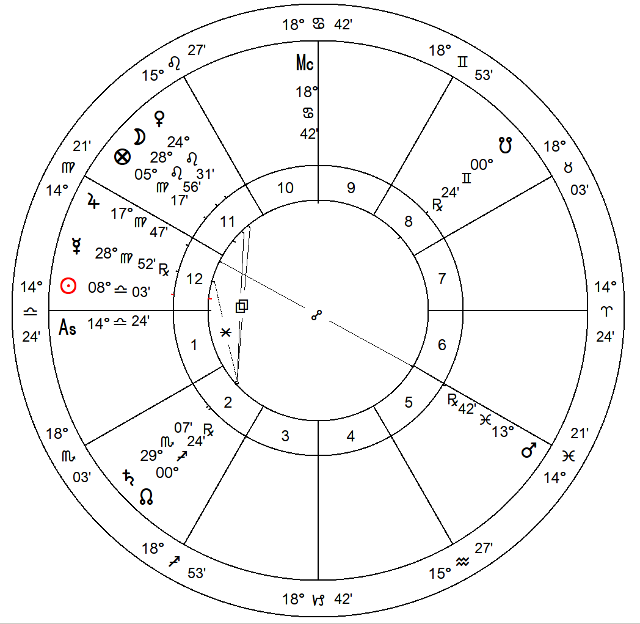 By Primary Diretion, July 13, 2016, assumes as PM, MH set to Neptune, dispositor of Mars. Secondary Progressed Moon conjunct to the ASC. "We know very little about her private life, but she went through a very turbulent patch between Sept 1980 and (probably) early 1982. Her father, who was a vicar, married her and Philip in Sept 1980 and 13 months later was killed in a car crash. Her mother, who suffered from MS, died a few months later (I haven't got a date but probably early in 1981). That's quite a series of life-changing events, especially as she was an only child." This sounds Plutonian to me, suggesting 22 cardinals (specifically Libra-Aries) on an axis. Tr. Pluto was around 22 Libra during these years. According to the "England & Wales Deaths" database, her mother Zaidee Brasier died on Jul-Aug-Sep Quarter 1982. The British has this strange system of registration. Her paternal grandmother Amy Braiser died on Apr-May- Jun Quarter 1967. To get the exact dates for the above events cost money. Her cousin Professor Martin Brasier died on 16 Dec 2014. The other events I used were from Wikipedia. Meanwhile, I rectified her chart to 09.59.32 BST Asc 9Sco06'. Thanks, Very useful biographical information for researching her chart. Thank you Isaac. You obviously have a reputation as a specialist in rectified charts. Thank you for sharing that extra data here. Can I ask you how many key dates you usually use to consider a rectification? Thanks I will display your chart when I get a chance. Thanks. I tend to use whole sign and equal. Mars would need to be in the 5th by quadrant & Moon in Virgo for me. For me Scorpio rising and Capricorn rising are the two plausible ascendants. 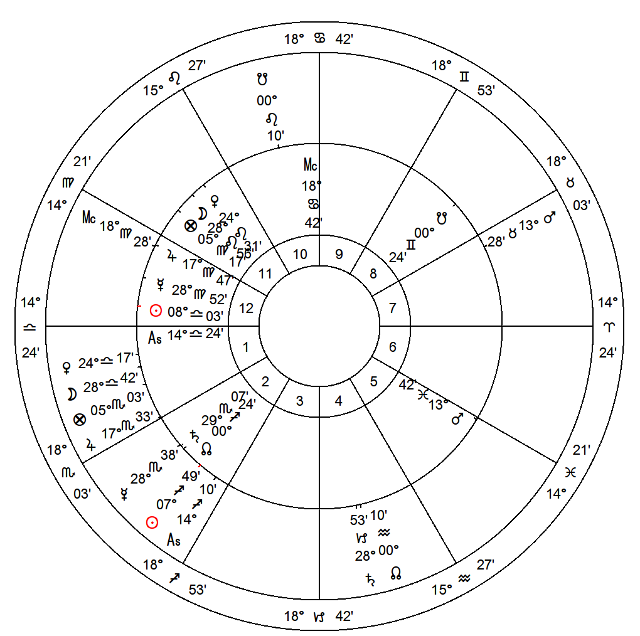 By Placidus/Topocentric Mars is only in the 5th house (using 5 degree rule) up to around 09.30am. After then it drifts by diurnal motion into the 4th. But the Moon only shifts to Virgo at 09.25. So if we want a Moon in Virgo and Mars in the 5th by Placidus/Topocentric we only have a time slot of between 09.25-9.30. From a whole sign and equal chart basis I find a Scorpio rising chart fairly plausible. I am still researching key dates. However, we do know a few things. She cant have have children so I am looking for either an infertile sign on the 5th and or a malefic present there. Scorpio rising gives us Pisces on the 5th cusp (Equal/WSH). A fertile sign but it contains not only a malefic but a Rx one , out of sect. Another thing is that looking at profections she is in a 12th house profectional year. Not a time generally associated with success. So I am looking for a house before the ASC that has the Sun or a benefic to counter this. With Scorpio rising we have the Sun and Lot of Fortune in Libra. The House ruler is Venus in the 10th place. That seems a reasonable explanation. But...Venus here is peregrine, totally out of sect, conjunct Pluto, and square Saturn! That doesn't seem like a benefic that has great gifts to bestow in a 12th house profectional year does it? The only other sign I see as plausible with a Virgo Moon is a Capricorn ASC. Many of her characteristics could fit Capricorn. That would give a benefic ruling the 12th (Jupiter). Jupiter is in detriment in Virgo. However, it is the benefic of sect in this chart. Jupiter here is also in its bound (Egyptian). At present I am exploring around a 3.30pm time as Jupiter is trining the ASC from the 9th Equal/WSH. We do find a fertile sign on 5th house cusp (Taurus) with a benefic ruling it. However, with a Capricorn rising chart Venus is in the 8th Equal/WSH house, peregrine, totally out of sect, conjunct Pluto, and square Saturn. That fits quite well. Especially, as Venus symbolises a woman's sense of femininity. In some respects I think this inability to conceive has left May feeling incomplete as a woman.